These days one immediately associates Alexa Johnston with baking because of the stunning success of her 2008 Penguin title, Ladies a Plate. That reputation is going to be further reinforced in September with her sequel Second Helping. So this utterly gorgeous, highly illustrated look at the life and work of Frances Hodgkins , published to coincide with the 140th anniversary of the artist's birth, may surprise some but of course Alexa Johnston is an art historian and biographer and was well known and respected in these fields long before she ventured into more domestic subjects. The Dunedin Public Art Gallery in part owes its very existence to the Hodgkins family and as such has a long and enduring relationship with them. The Gallery and the City of Dunedin are extremely proud of the connection with Frances Hodgkins. This publication pays tribute to the vision, presence of mind and good will of those who collected and supported this artist. 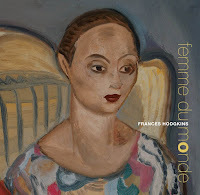 Frances Hodgkins:Femme du monde celebrates a woman who set out to experience and transform the world, but who always retained a connection with Dunedin - the place she called home. This is an exquisite book and I offer my congratulations on such a fine publication to both author and publisher. The images below do not do justice to the book of course but will serve to give you an idea of the appealing design and layout. Link here to the Otago Daily Times for a report on the book's launch. And for that paper's review of the book, link here.